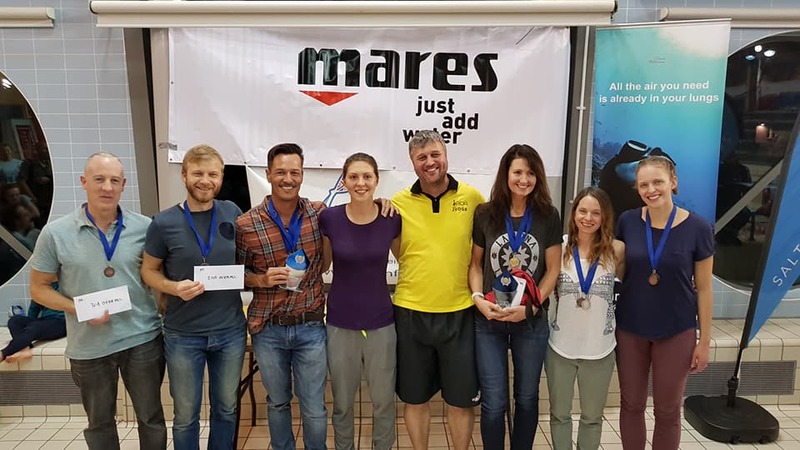 This weekend, Bristol Freedivers hosted their 3rd Bristol Blue Freediving competition, which this year incorporated the British Freediving Association’s National Freediving Championships. The event took place across two days, with the dynamic (with fins) taking place at Hengrove Park Leisure Centre on Saturday 24 March and the dynamic no fins and static at Horfield Leisture Centre on Sunday 25. 33 athletes gathered in Bristol from all across the UK and from across the water too – 9 nationalities in total were represented. The level of experience varied vastly, from world champions and national record holders to 7 people competing at their first competition. Testament to a fantastically well run event, twenty-seven new personal bests were set. The winners of the National Freediving championships were Adam Drzazga and Beci Ryan and the overall male and female winners of the competition were Stig Pryds and Camilla Salling Olsen, true to their Viking roots they came and conquered! The gold medalists for the static element were Georgina Miller (06:28) and Adam Drzazga (06:13), for dynamics it was Camilla Salling Olsen (184m) and Stig Pryds (192m) and for dynamic no fins Beci Ryan (149m) and Stig Pryds (150m). The standard of newbie performances this year was so high, with Rosie Williams (04:32 STA, 111m DYN, 100m DNF) and Mik Bjorkenstam (05:30 STA, 109m DYN, 117m DNF) crowned the winners. Newbies David Mellor and Alex Atkins also deserve a mention, the competition for this newbie spot was unusually high and their performance were impressive with a lot more clearly still to give. Freediving is an incredibly wonderful and strange sport where at one moment athletes are trying their utmost in the water to give their best performance and at the next, coaching someone else to reach their peak performance, even if it means they outrank you or beat you to a place on the podium. Bristol Blue’s 3rd competition was no exception to this rule, the organisers managed to create a calm, relaxed atmosphere, belying the incredibly hard work and effort that had clearly gone on well in advance of the event and behind the scenes on the day – from training and arranging the super slick safety team, organising the AIDA judges and assistant judges, securing (top) sponsors and managing an enthusiastic and friendly team of volunteers. Keeping control a bunch of nervous freedivers attempting to get into their zone of zen isn’t always easy and they did a wonderful job! Last and not least, huge thanks to the amazing sponsors who provided fanstasic prizes and support – MARES – just add water, Finisterre, British Freediving Association, Freedive Ibiza and Saltfree Divers. Words by Beci Ryan, Photography by Daan Verhoeven. Bristol successfully hosted its second annual international freediving competition, covering the three main pool disciplines. The two-day event, which took place on October 21 and 22 at Horfield Leisure Centre, was hosted by Bristol Freedivers and was supported by the Mares, Saltfree Divers, Dr Apnea, the British Freediving Association, Lobster Freediving Weight, Finisterre, Nomenca, D Smith Flooring, and Blue Water Freediving School. The event attracted experienced competitive divers as well as some new faces, both from the UK and overseas. Eóin Clarke set a new Irish National Record for his 137m DNF swim. Best Newbies were: Male, Paul Sutton; Female: Hannah Thurston-McGowan. In recognition of all those who sacrifice their time and make great efforts to ensure freediving competitions are a success, special prizes were given to Becca Warren for providing Safety and Shirley Turner for coaching. Photos of the event and full results can be found at www.bristolfreedivers.co.uk/photos and at Facebook at Bristol Blue Freediving Competition. 2. Freediving is the sport of diving underwater on one breath without the aid of mechanical breathing apparatus. The roots of freediving stretch back in time to the very origins of human development where the ability to hold our breath allowed us to gather food and resources at all depths. Today, the sport encompasses recreational activities like snorkelling and spearfishing as well as competitions. Some competitive disciplines include “static apnea” (a stationary breath hold in water), “dynamic apnea” (a horizontal swim underwater on one breath with or without fins) and “constant weight” (a vertical dive to depth on one breath with fins). As with any extreme sport or sport involving water, freediving should only be undertaken with appropriate training and supervision. Freedivers draw upon a wealth of knowledge from within the freediving community to dive safely. Through ongoing training and education, freedivers develop increased awareness of and control over their bodies and minds. 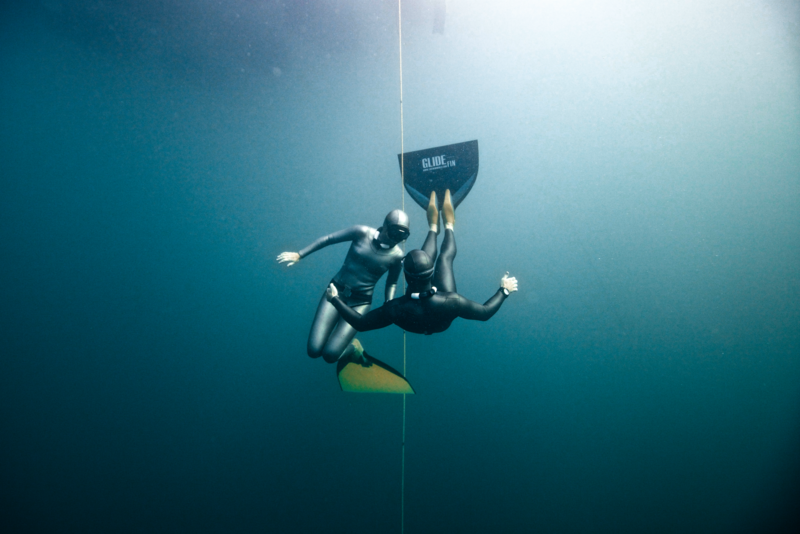 The BFA recommends that new freedivers take an AIDA freediving course. Bristol hosted its first international freediving competition on Sunday 27 November with 30 competitors diving for prizes in static apnea, dynamic and dynamic without fins. Alice Hickson won the overall competition for the ladies, and Adam Drzazga for the men. The ‘best newbie’ award was won by Dave McGowan for the men and Kate Leney for the ladies. Eoin Clarke set a new Irish National Record for his 134m DNF swim, increasing his previous record distance by 17 metres. He said “I’m proud to have been able to represent Ireland and I hope this will encourage more Irish swimmers, home and abroad, to get involved in the life changing sport of freediving”. It certainly was a day for the Irish as Dave McGowan also set a new Irish National Record of 05:59 static. The Men’s DYN discipline was won by Mike Benke. Phillip Fennell swam 162m DYN to claim the top prize for male dynamic swim. Alice Hickson won for the ladies DNF with a 154m swim, and Anita Jasso winning with a 150m DYN. Alice’s static of 06:36 minutes secured her the overall lead, and similarly Adam Drzazga’s static of 06:38 winning for the men. 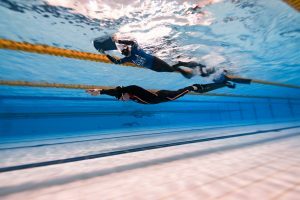 The competition, held at Horfield Leisure Centre in the North of the city, was hosted by Bristol Freedivers club, which has been active since 2008, supported by the British Freediving Association, PADI, Divesangha clothing and OMER diving equipment. Organiser and founding member of Bristol Freedivers Andy Jardine said “In Bristol we’ve been talking about running a competition for some time, so to make it happen was really exciting. The best part for me was seeing so many people from all over the UK, different clubs and new faces all getting together and having a great time”. Some stages of the competition were streamed live through PADI’s online TV system. The morning static videos reached over 35,000 views and 18,000 views of the closing ceremony. We are encouraged by this increasing interest in freediving in the UK and abroad, and hope to see more new faces at competitions and recreational diving meets in the future. Welcome to the BFA website. Here you will find the latest news in the journey of British freediving.